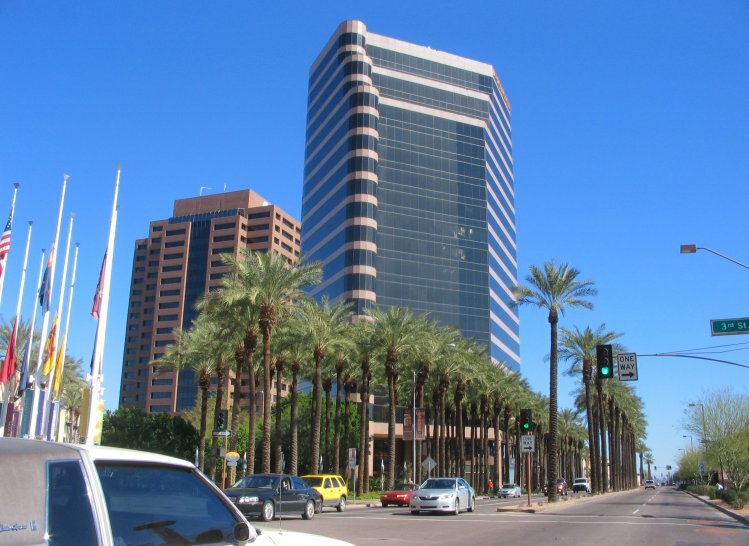 Maricopa County is known for its abundance of beautifully kept and manicured palm trees like these iconic tall palms in downtown Phoenix. Palm trees are abundant here in the Phoenix area, and many of us have them in our own yards. They can be a welcomed addition to any yard that adds life and character. However, if not trimmed properly, palm trees can be in danger of dying as well as being a major hazard to your house. Palm trees have unique trimming needs compared to other trees and wildlife on our property. Because Arizona experiences yearly monsoons and storms in the summer, special consideration must be taken so your palm trees can not only survive, but so they don’t create an unnecessary hazard. Top Leaf can provide palm tree trimming services in a variety of ways. Before the anticipated monsoon season begins in Arizona, Top Leaf can prepare your palms and other trees to withstand the heavy winds and rain. During the rest of the year, regular maintenance of dead or low-hanging fronds will keep your palm trees healthy and beautiful. Call Top Leaf today at 480.833.6465 if you are in need of palm tree trimming services, and our certified experts will happily care for your palms with the most advanced and proven methods.